The course my art history research takes often leaves me emotional. I cannot comprehend the sacrifice that artists must make in order to put their talent and message out there. 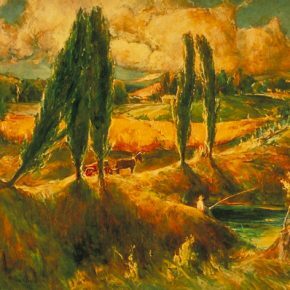 Maybe I’m too much of a New Age-Sensitive Guy, but learning about the struggles of now deceased Utah artists causes me to be grateful that I have no talent. I can cook, but if I fail at it, I can just dial “The Pie” and soon get their version of cooking — delivered. I receive zero criticism for my own efforts, just lovely pizza that helps me know that I always have a back-up. 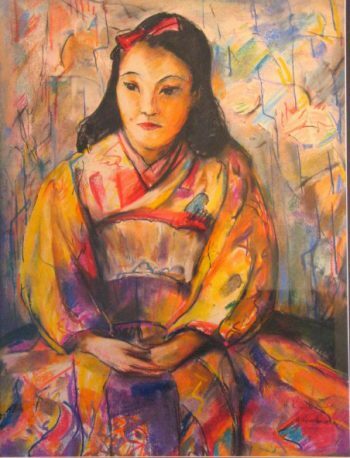 One of my first exposures to David Howell Rosenbaum [1908-1982] was in my attorney’s office, where I viewed two well-balanced oil paintings hanging on his wall. Shane Topham told me some of Rosenbaum’s background as I stared at these two fine examples that capture Utah’s magnificent landscape. Rosenbaum carried my attention and as I have learned more about him in the past decade or so, I have become more sensitive to the far-too-many plights of artists. 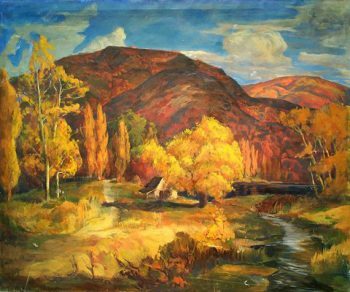 A morose, withdrawn man, who shunned radio, televisions and cars, he was one of Utah’s more accomplished landscape painters as well as being a talented portrait painter; he also liked to express his caustic personality in expressionist narrative paintings, throwing paint at Adolph Hitler as well as Pablo Picasso, and taking swipes at Modern Art in general. According to fellow Art Nurd Janie Rogers, Rosenbaum’s family was among the first Russian Jews to convert to Mormonism and move to “Zion.” A Wikipedia entry about his great-grandfather, Morris David Rosenbaum, says he was from Fordon (then in Prussia, now in Poland), emigrated to the United States and joined the LDS Church after meeting Alexander Neibauer, the first Jewish convert to the LDS Church. He married one of Neibauer’s daughters, as well as a daughter of Apostle Lorenzo Snow. David Howell Rosenbaum’s own father was a salesman and still lived in Brigham City when Rosenbaum was born there in 1908. He was a pragmatic man who told the aspiring artist, “You can’t make a living painting. You’ve got to work.” When he was 23, Rosenbaum studied at Utah State under Calvin Fletcher, at about the time that Fletcher, mindful of the relatively dreadful art program at the school called upon such venerable artists as Birgen Sandzen, Ralph Stackpole, Otis Oldfield, and Ralph Pearson to serve as artists in residence at the Logan school. 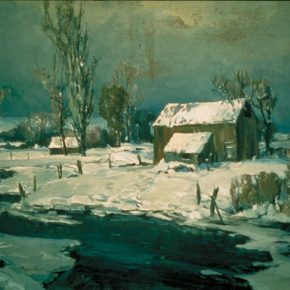 James Haseltine called the Logan group the “Ferment in the north,” and placed Rosenbaum with Henri Moser and Everett Thorpe as the only artists Utah produced who might be called expressionists (100 Years of Utah Painting, p. 35). 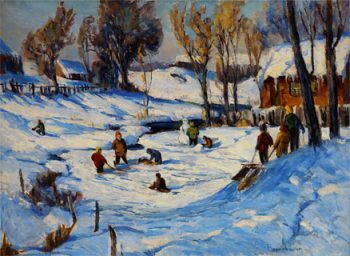 Several years after his abbreviated studies with Fletcher, in 1938 Rosenbaum made his way to the American Artists School and Art Students’ League in New York for a year of structured training. In 1941, Rosenbaum opened a studio in Ogden but it was not long before he was drafted into the Navy “Seebees,” the slang term for the Construction Band of engineers and laborers who created airfields, ports, and other military installations during World War II. In 1942, Rosenbaum was sent to Guadalcanal, where he painted energetically, working in watercolor and pastel because oil paints were unavailable. Mostly he painted the natives and the surrounding geography, including the jungle, and sent some 150 to 200 paintings home. The military was absent in the works, possibly because of Army policy but more likely because of the artist’s hatred for the Navy. “He hated that [military] with a passion,” said his brother, Paul, in a 1983 interview conducted by Kathy Bradford with him and his son, Paul A. Rosenbaum. In Guadalcanal, Rosenbaum contracted severe dysentery and was shipped back home to be treated at Bushnell, a military hospital located in Brigham City, where he was cured and discharged from the service. Rosenbaum liked photography and attempted briefly to sell some of his pictures. He abandoned the commercial idea, but continued to travel—mostly to California—with friends and used his camera frequently. 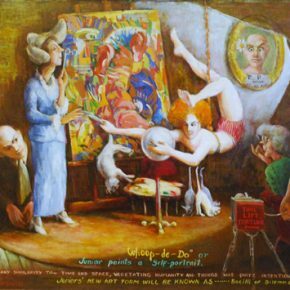 He continued to paint but became very frustrated with trying to play the game of selling art, and, according to gallerist David Ericson, for all intents and purposes ditched his painting career in the early ‘50s. How did he live? For 25 years Rosenbaum worked in Ogden at the Defense Depot as a warehouse janitor. In the last few years of his life, Rosenbaum’s outlook was as sour as ever. He told his family he didn’t want a funeral service, speakers, songs, or “anything like that. I just want to be cremated.” His brother Paul asked him, “Well, do you want your ashes spilled over Ogden from an airplane?” Rosenbaum replied, “No. Flush the damn things down the toilet.” Upon his death the family elected to forgo the “burial by facility,” and held a short dedication, placing his remains in the Brigham City Cemetery. Glover also told me about Bruce Fowler, a California music producer, trombone player, and former member of a later vintage of Frank Zappa’s Mothers of Invention. Fowler, who now lives in Woodland Hills, is a Utah native and attended Skyline and the U (where his father was a professor of music). 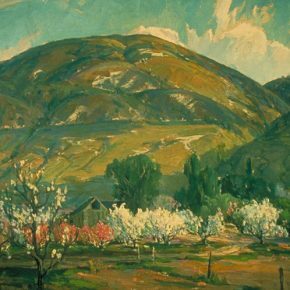 He’s also a great- grandson of early Utah artist and poet Alfred Lambourne (watch for a future column about Lambourne, one of the “Block Artists” and namer of Lake Blanche, among other interesting tidbits). 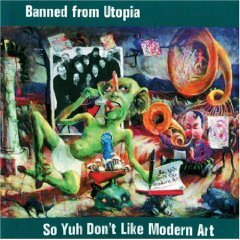 He purchased a Howell Rosenbaum original painting for the album cover of Banned from Utopia’s 1988 “So Yuh Don’t Like Modern Art.” Note that on the cover a photo of the band has been slipped into the Rosenbaum painting. 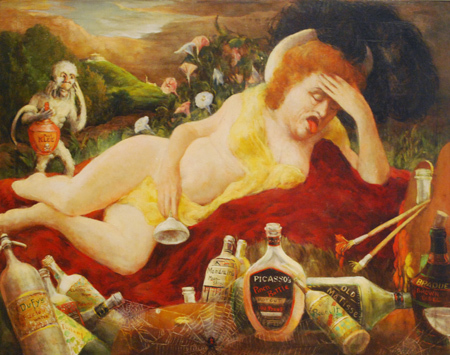 The “Banned from Utopia” is an example of one of Rosenbaum’s caustic narratives, cynical though charming paintings that blasted, among other things, modern art. He especially had issues with Picasso and included him in three paintings. In the first painting, Picasso is seduced by a three-eyed, two-mouthed woman, a clear mocking of Picasso painting cubist-inspired portraits. 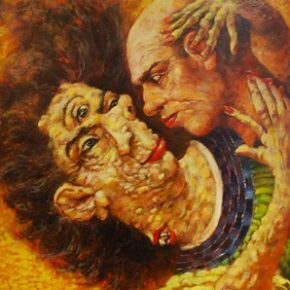 Some have said that the bald subject in several Rosenbaum paintings are self-portraits. It is trite to associate the darkness in an artist’s paintings to the darkness he feels, but like Van Gogh, one could gather obvious messages of depression from many of Rosenbaum’s artworks. 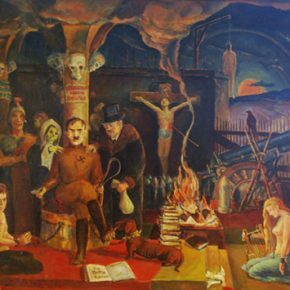 The anger and contempt he spewed into his work is evident in his painting of Adolph Hitler, where burning books, ravens and skulls, a crucified Communist, as well as a chained young man (perhaps a self-portrait) surround der Fuhrer, who is comfortably seated with a copy of Mein Kampf opened at his feet. You be the judge about what it all means but the general dark theme coupled with limited value changes in the painting certainly do not make this painting one that you’d hang in your living room. The Rosenbaums that people do hang on their walls are his landscapes, among the best executed at the time. The flashy landscape of Mantua [Logan Canyon area] is reminiscent of a familiar LeConte Stewart composition, but with enough color to drain two sets of inkjets. 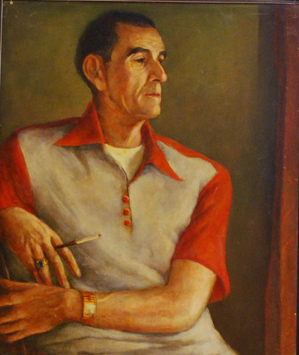 Although not known for his portraiture, Rosenbaum exhibited a credible talent for such things. On the reverse of his “Picasso Being Seduced by Modernism” painting is a very detailed portrait of a friend decked out in a Kramer shirt. His hands and jewelry details are expertly crafted and the cigarette holder is an attention-grabber. Rosenbaum’s quirky existence is easily overshadowed by his talent and production of multiple works in his relatively short career. Had he been receptive to some strong direction and more philosophical approach, he would have no doubt experienced major acceptance. The pleasure of observing Rosenbaum’s fascinating body of work is punctuated by his tortured and relatively uncelebrated career. The emotion that I feel about such artists is mostly soothed by spending time with their works and understanding the difficulty of their career path. Next month’s Alder’s Accounts will feature Pablo O’Higgins, whose works on paper will be on display at the UMFA beginning February 18. 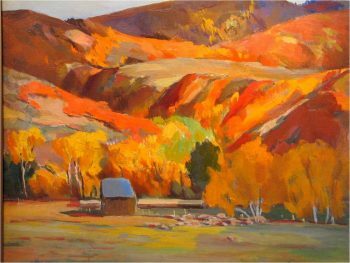 Tom Alder, a Salt Lake City native, left a 30-year mortgage banking career in 2009 to open Alderwood Fine Art, specializing in early Utah art. He held an MA in Art History, taught at the University of Utah, and served on various boards in the cultural community. He died in 2018. I’m constantly impressed by Tom’s research, analysis, personal comments, and writing style. His articles are interesting, add just the right amount of local “color” and read as if he is talking to me as a friend. Whenever I receive 15 Bytes I immediately turn to Tom’s column first. What a gift it is to have Tom write for 15 Bytes and open our eyes to “new” old artists and their work. 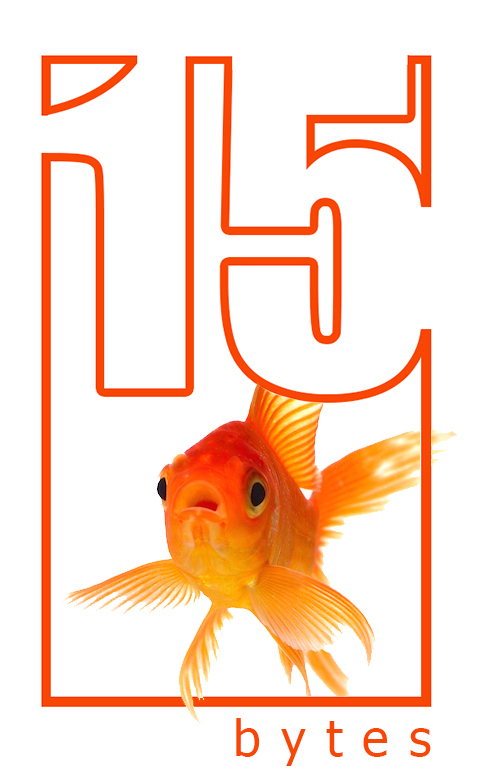 Thanks 15 Bytes for including Tom’s work in your publication!